Modern perspectives of law enforcement are both complex and diverse. They integrate management and statistical analysis functions, public and business administration functions, and applications of psychology, natural science, physical fitness, and marksmanship. They also assimilate theories of education, organizational behavior, economics, law and public policy, and many others. Modern law enforcement is a blend of both theoretical knowledge and applied practice that continuously changes through time. 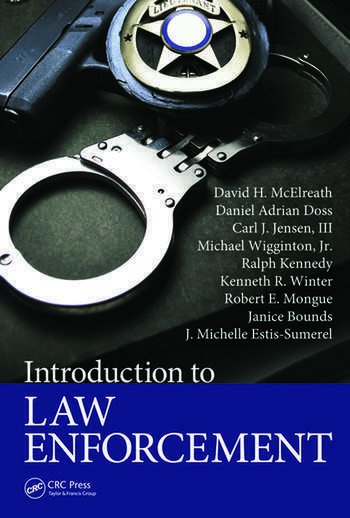 With contributions by nine authors offering a diverse presentation, Introduction to Law Enforcement goes beyond the linear perspective found in most law enforcement texts and offers multiple perspectives and discussions regarding both private and public entities. Through this approach, readers gain an understanding of several dimensions of the subject matter. Adaptable across a wide range of learning environments, the book uses a convenient format organized by agency type. Pedagogical features include learning objectives, case studies, and discussion questions to facilitate reader assimilation of the material. 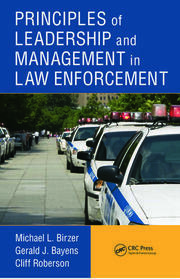 Comprehensive in scope, the text presents a robust consideration of the law enforcement domain. What Causes Corruption in Policing? Daniel Adrian Doss, Ph.D., has served as assistant professor, College of Business Administration, University of West Alabama; assistant professor, Belhaven College; adjunct assistant professor, Embry-Riddle Aeronautical University; and chair of graduate business and management, University of Phoenix (Memphis). His professional career has consisted of software engineering and analytical positions in both the defense and commercial industries. Carl J. Jensen III, Ph.D., is the director of The University of Mississippi’s (UM) Center for Intelligence and Security Studies. He also is a member of UM’s Department of Legal Studies and works in an adjunct capacity as a senior behavioral scientist with the RAND Corporation. Dr. Jensen was a special agent with the Federal Bureau of Investigation (FBI) for 22 years. His FBI career included service as a field agent, a forensic examiner in the FBI Laboratory, and an instructor and assistant chief of the Behavioral Science Unit. Michael Wigginton, Ph.D., has worked as assistant professor of Criminal Justice and director of The University of Mississippi Master of Criminal Justice Executive Cohort Program, Department of Legal Studies, at The University of Mississippi. 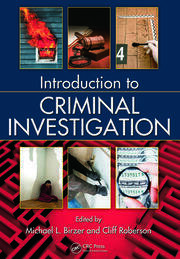 He is the author of numerous publications on the criminal justice system. Ralph Kennedy, M.Ed., has served as an instructor of criminal justice at The University of Mississippi; former adjunct instructor, National Center for Biomedical Research and Training, Academy of Counter-Terrorist Education, Louisiana State University; and retired special agent, U.S. Secret Service. He has also authored several articles for educational and law enforcement professional publications. Kenneth R. Winter, M.S.C.J., has worked as instructor of Legal Studies, The University of Mississippi; instructor of criminal justice, Delta State University; and executive director, Mississippi Association of Chiefs of Police. He is a Certified Latent Fingerprint Examiner and Certified Senior Crime Scene Analyst by the International Association for Identification. Robert Mongue, J.D., is an assistant professor of Legal Studies at The University of Mississippi and was an adjunct instructor of criminal law and paralegal studies at Andover College in Maine. He has over 30 years of experience as a trial and appellate attorney in both state and federal courts, including work as both a prosecutor and a defense attorney. Jan Bounds, M.B.A., associate professor of Legal Studies, has been involved in legal studies and has taught at The University of Mississippi for 36 years. Ms. Bounds has extensive experience with the court system at both the state and federal levels—teaching court reporting and working with the court systems. She has also worked in the U.S. Attorney’s Office for the Northern District of Mississippi. J. Michelle Estis-Sumerel, M.S., has served as coordinator of eLearning Instruction, Itawamba Community College; and adjunct instructor, Department of Legal Studies, The University of Mississippi. She is also the creator of several courses in law enforcement, corrections, and homeland security.